Anyone who’s interested in participating in any outdoor adventure needs to have the best shoes to use. Particularly when it comes to rock climbing, you will have to deal with the terrain, and there are no shortcuts. Oftentimes you’ll have to tiptoe around a steep cliff’s edge. Can you imagine rock climbing with traditional footwear? You can’t do this while wearing normal shoes, which is why having the best rock climbing shoes is a must. Make the most out of your rock climbing experience by acquiring a pair of shoes that are specifically designed for rock climbing activities. These types of shoes include features like a tight grip, flexible shapes, impressive comfort and lightweight. Rock climbing can be a dangerous sport, but if you’ve got the right shoes on your side, you’ll be able to handle even the most precarious edging positions with ease. We are here to help out with your shopping needs. In this article, we have provided some basic information regarding which features are important to look for in a pair of rock climbing shoes. 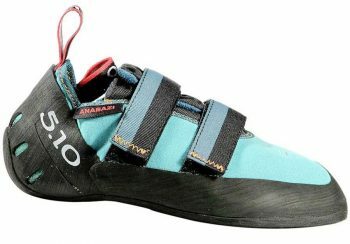 Then we’ll slowly make our way up to the interesting part: the top 8 rock climbing shoes available on the market today. Let’s get to it! What should you do to ensure that you land the right rock climbing shoes? Generally speaking, ideal rock climbing shoes are made with distinct smoothness, padding and close fits. But truth be told, it all depends on circumstances at hand. Different types of rock climbing shoes might be suited for different rock climbing activities. We’ll explain more about that below. There is a big difference between shoes made of hard and soft rubber, and the type of rock climbing determines which type of shoe will work best. If you are familiar with the terrain, that is an added advantage. Soft shoes are usually more sensitive and if you have a precise foot, this is a fine option. However, they have one limitation. Soft shoes do not give the necessary strong support and tend to be painful when jamming or edging on rocks. On the other hand, a stiffer climbing shoe is perfect for providing a strong support. They are more durable due to the inclusion of thicker rubber linings. Your rock climbing performance can depend on the shape of the shoe. Mostly, rock climbing shoes have a downturn shape to sustain the movement in an overhanging terrain, while providing strong body support. Most rock climbing shoes are not appropriate for walking so they are usually worn at the base of the climb. But these days, rock climbing shoes come in more varied shapes than ever. There are hooked, cambered, and flat rock climbing shoes. Each design is perfect for a specific terrain. Hooked toe shoes are ideal for climbing overhanging terrains or vertical face. The hook design enables you to pull on steep footholds while producing more power from your feet. Flat lasted shoes are ideal for low angle cracks and slabs. Although they do not fit perfectly, they are the most comfortable rock climbing shoes. Camber designed shoes are fairly strong. These shoes give a worthy rock climbing experience, and they give you a more power from slight grips. This is the most recommended equipment for beginners. If you are a newbie in rock climbing, don’t go for the professional’s gear. Do you need a slip on or a lace up shoe? Slip on tend to have flat lasted designs, and all you need is to slip it on. Although it might be not easily adjustable, it can be a highly comfortable shoe. Lace ups are the best for long day workouts. They are easily adjustable and gives you a chance to release any pressure while making your activities enjoyable. Rock climbing shoes also come with a Velcro closure system these days. Velcro is easy to adjust, but not very durable and may become less secure after prolonged use. If you want a perfect rock climbing shoe, it should provide a great fit and flexible enough to give your feet the necessary relaxation. Try it on and check if it’s a good fit in order to give you a great climbing performance, control, and extra power. Rock climbing shoes generally offer a snug fit. They have to since you are going to need as much flexibility as you can get while edging around those tight crevices. But don’t go for anything that’s too tight lest it restricts your range of movements instead. Not all rock climbing shoes are created equal, so it’s important that you choose properly–especially as they can be quite expensive. When buying a pair of rock climbing shoes, check for something that your budget can allow you. There are many pairs out there that can accommodate a number of budget ranges. Stay focused on your budget, and know that there are many options available. By taking into consideration these factors, you should be able to shop for a pair of rock climbing shoes that’s right for you. 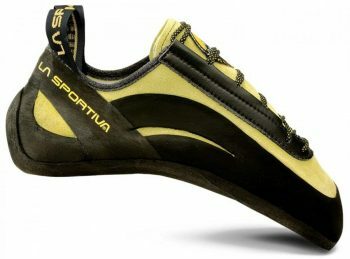 The La Sportiva Genius Shoe is a highly recommended pair that will give you a maximum rock climbing utility. It is incorporated with different technologies and features to make it a perfect outdoor gear. Made with a hooked downturn toe design, it is good enough to use on steep rock terrains. The P3 midsole technology is ideal in providing you with a tight grip and maintenance of a downturned shape. Imagine a shoe that will fit any foot type! Your hike won’t be a boring thing again. This is a shoe with a high quality grip rubber sole that gives an edging ability and maximum performance. With a shoe of such sensitivity, it is easier for you to make feet adjustment. This pair is comfortable enough to give you the necessary comfort required, and it is no doubt a top outdoor gear. If you have ever thought of crack climbing, you have just landed the best equipment. Just be aware that due to the stiffness of the heel, which is the factor that actually gives this shoe its famed durability, it is not very responsive and will take some time to break into. Related: While rock climbing, don’t forget to bring this Black Diamond ATC Belay Device with you. This device will keep you anchored so that even if your hands slip, you won’t fall very far. The Five Ten Anasazi Shoe is one of the most comfortable shoes available. It has become more popular in the past 10 years and many hikers prefer it for rock climbing. It boasts a very high sticking power, and you will enjoy its precise, strong support. It is designated to enhance an all day hiking adventure. Are you planning to have an extended outdoor adventure where you want to climb rocks? Do you want a shoe that will enhance an all day workout without pressure? This is the ideal shoe for you, as it maintains high precision. With a stealth C4 rubber and an improved fit, this is a highly anticipated shoe that many people term as a perfect solution to their climbs. It is made up of a high quality synthetic material to facilitate durability. You don’t need to spend money time and again looking for what will suit you for hiking. However, this shoe does not have an aggressive casing and hence not perfect for overhung workouts or edging. Related: Rock climbing may be a type of relatively extreme sport. The thrill is the best part of it, but it doesn’t mean that you should forget about taking care of yourself while you’re out there. This Climb On! Skin Care Bar is necessary because both men and women need to protect themselves against the risk of skin cancer from excessive sun exposure while rock climbing. Take your rock climbing to another level with the La Sportiva TC Pro Shoe. It is a favorite rock climbing shoe to enhance your climbs. It’s time to unlock and stretch your climbing limitations, and this might be what you have been missing to achieve your goals. This shoe has a high performance, yet ultra stiff durability. It is built in a more technical way to maintain high precision while jamming, band smearing and vertical edging. It works out well on a vertical terrain with little to no chance of slipping. It is stiff compared to other designs and with its high precision. It gives off a unique feel. Although it takes some time to break into, you will not experience unnecessary fatigue or discomfort as it is made in a way to give you the maximum comfort needed to climb rocks and it is the perfect gear to carry on top of mountains. Don’t worry about toe protection! With the thin padding above the toes and in the ankles, it ensures that you are highly protected at any time. Related: This is a great pair of shoes for both beginners and veterans in rock climbing. If you are a beginner, though, you might want to polish your knowledge by reading this The Crack Climber’s Technique Manual first. Authored by Kent Pease, a rock climber with years of experience under his belt, you’ll learn quite a lot particularly regarding jamming. 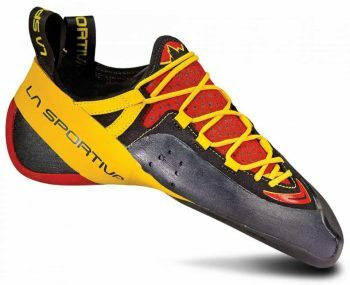 The La Sportiva Miura Shoe is a top rock climbing shoe that has been technically designing to offer you maximum support. It has been used over the last 10 years, with quality features such as tight grip, speed lacing system and a directional lining. The lacing system maintains a tight grip on unfriendly terrains. While climbing rocks with this shoe, you will certainly feel that great freedom. The shoes upper is made of leather with a mix up of Dentex Lining. This is ideal for maintaining a good stretch, thus allowing your foot to gain comfort. An itching toe is a gone case; the shoe has a high asymmetry and a downturned toe, making sure that the shoe stays in its place. The XS rubber technology ensures that the shoe stays well attached to edges with no chance of slipping. This shoe is recommended due to its quick break in period, which is usually long for other pairs. This makes the shoe feel stiffer. It is easily adjustable depending on the weather and it is an outright option for any ideal rock climber. Related: Now that you’ve got your feet covered, you’ll want to get your hands covered properly too. After all, it doesn’t matter how non slip your shoes are if your hands are slippery. This Black Diamond White Gold Chalk is the perfect stuff to improve your grip with. 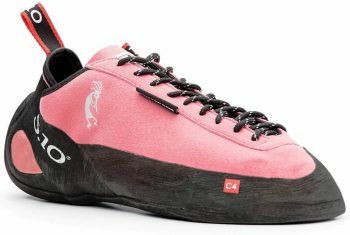 Women who are into rock climbing will have a lot to like with the Five Ten Anasazi LV Shoe. Many of its features are designed to bring the best rock climbing experience for women. Yes, it is more awesome than you think. It is a moderately good profile footwear and with its affordable price, what more can you ask for? Are you an indoor or outdoor climber? It is designed to suit both purposes and weighs moderately such that any woman will like how precise it is. It is made with a stealth rubber sole that gives the climber an excellent edging and high friction. This shoe is made with a high quality synthetic material and has Velcro straps to ensure that it is easily adjustable. It will last longer than other models in the market, and it’s unique on its own. The performance of the shoe is downright solid, and its low volume technology will ensure that the shoe will provide the maximum satisfaction possible. One thing you’ll want to keep in mind when purchasing these shoes is that they run small. They have to be in order to offer a high precision performance, so this shouldn’t be a problem, but just make sure you pick a pair that your feet can squeeze into. 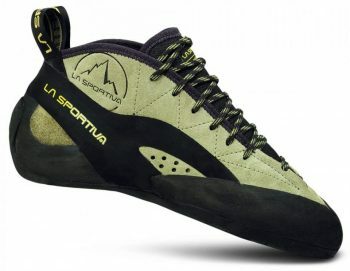 The La Sportiva TarantuLace Shoe is a top beginner climbing shoe made a famous brand. Considering the nature of women, it is designed in such a way to offer more comfort and stability while you are climbing. It is perfect for climbs and if you don’t go above V2, this is a nice option for you. This shoe has a thick sole of about 5.5 mm; ideal for maintaining the shoe stiffness. Although, this can also be a double-edged sword. If you want to challenge tricky areas where edging will be required, make sure to take some time to break into these shoes first. To ensure maximum durability, this shoe is made up with a FriXion rubber. 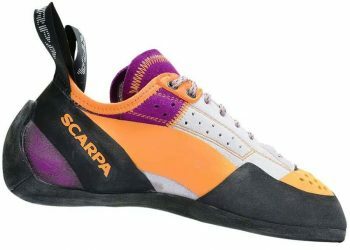 It is long lasting and tough, which makes it undoubtedly one of the ideal shoes for rock climbing. It is more versatile and is a perfect pair for those are still starting out with climbing. 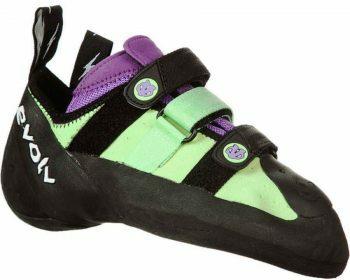 If you are in the market for a beginner rock climbing footwear, you just can’t go wrong with this one. Related: If you have just started testing the waters of rock climbing, you may not have all the equipment you need yet. If you don’t have time to spend on researching and purchasing all the equipment one by one, buying everything in one complete Black Diamond Primrose Harness Package should make it a lot simpler for you. It is a generally a great shoe which features a tight grip to hold you even on the steepest rocks. They offer you a great comfortable feeling, and you know what? It is worth its price. Many customers recommend evoLV Shaman LV Shoe due to its high precision and lower volume. It provides a nice, great fit and it will maintain every step you make while climbing on the rocks. Women with a big toe knuckle will be glad that this shoe provides a spacious knuckle box. To ensure the very best in terms of comfort, this pair features a microfiber lining. The rubber sole ensures that your feet will be able to grip those rocks with ease. It’s a great solid pick for even the most jaded lady climber. Just make sure to pay attention to which size you plan to purchase because these shoes run small. In most cases, you’ll have to go one size up. Related: For the rock climbing veterans out there that plan to wear these shoes while you challenge the steepest trails available, make sure to have enough chalk to get your hands covered. This METOLIUS Super Chalk absorbs sweat and provides ample friction, so it’s a great option. If you’re in the market for all day long comfort and precision for traditional and multi pitch routes, then you should consider the Scarpa Techno X Shoe. This pair has the necessary features to provide the long lasting comfort of a set lasted boot with moderate heel tension. The addition of Bi Tension Working lets this pair act in such a way as a turbo when it’s needed and softly rumble into the background for the smooth and luxurious climb when it is not. The asymmetric lacing provides the shoe with an ability to adapt more in terms of comfort in every terrain and ensures fit for a multitude of foot shapes. The shape is superb in breaks and wallets which ultimately contributes to comfort, friction, and protection. Solid with Vibram XS Edge rubber, this shoe definitely represents a fresh generation of balance between comfort and precision. These shoes are a bit tricky when it comes to their fit, though. They run rather small, but can also feel rather loose around the heel. You’ll want to be really careful about the size when you purchase this. Related: Since this pair of shoes has a design that’s rather unique, it will take some getting used to. You might want to try them out indoors first just to be safe. When it comes to indoor rock climbing, no other chalk will suit you better than this specially engineered FrictionLabs Loose Gym Chalk. The above guideline is an outline of what you should consider when buying a good pair of rock climbing shoes. If you expect to climb rocks or mountains, these are the specific shoes that you will be needing in order to make the activity simpler, safer and best of all comfortable. We recommend the above shoes for all types of rock climbers as they encompass the best features possible. For the best fit, it is always best to consider fitting the pair in person. So have tried rock climbing before? If so, what’s your favorite model or brand of footwear that you would recommend? Did any of the rock climbing shoes we’ve reviewed above seem like a good fit for you or do you think we’ve missed a pair? We would love to hear your opinions and experiences in the comment section.